Suitable for interior and exterior wood and metal. Coverage approx 10m2 per litre. 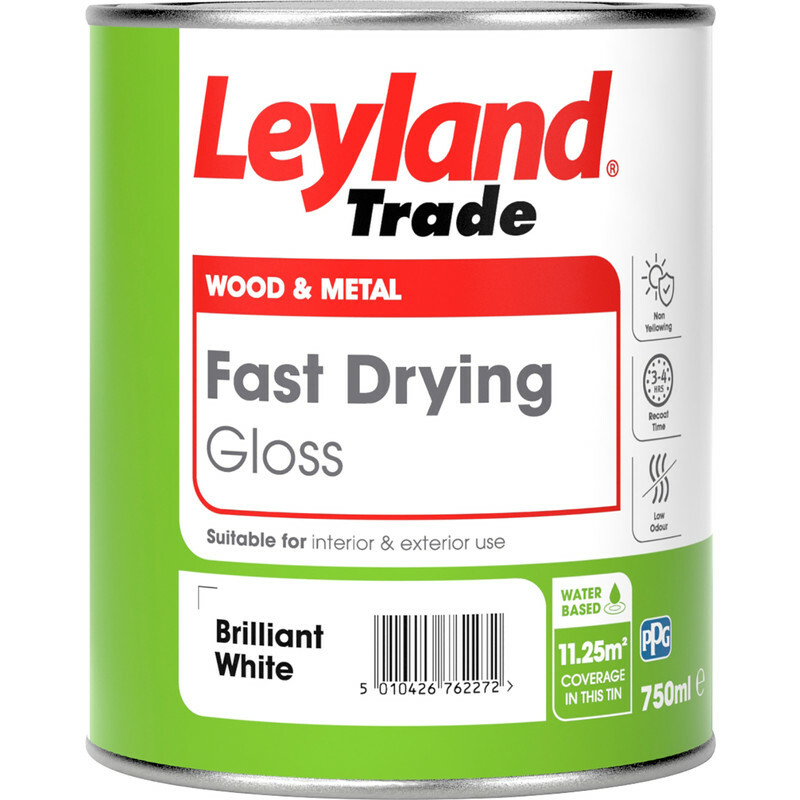 Leyland Trade Fast Drying Water Based Gloss Paint Brilliant White 750ml is rated 4.4 out of 5 by 54. Rated 4 out of 5 by Rodda from Great product I bought this today as was amaze. Think it will be my go to gloss paint from now on. Rated 5 out of 5 by Just Jan from Loving the finish Converted a few decorators to this water based gloss. Rated 4 out of 5 by Sparks2 from Brilliant Paint I have never used a water based gloss paint before but Leyland Trade paint seems as good as oil based and is much easier to use. It dries quickly. is easy to brush on and good for cutting in. No run marks and I didn't need masking tape. Brushes wash to in water. On the down side it does find any unprotected steel nails which show up as rust spots. Rated 5 out of 5 by Baldiesimo from Surprised This was better than I thought. No smell or fumes at all yet covered as well as traditional gloss paint. How hard wearing it is only time will tell. Very pleased. Rated 1 out of 5 by Stevi16 from Low odour but not glossy Says low odour, quick drying gloss. It is low odour and it does dry quickly but is more of a satin and after 4 coats with days between applications the old yellowed paint still shows through. Rated 4 out of 5 by A DIY customer from Needs patience A good product but dries too fast even in cold weather leaving brush marks. And don't expect it to behave like oil based gloss it won't, it requires a change in mindset! Once it's out of the pot on your brush you don't have much time to spread it. So you spend a lot of time correcting your work. You can get a better finish if you go over it damp brush. It's not as durable as oil based gloss. It doesn't encase your paintwork like oil gloss, it creates a skin over the surface. So when it's bumped or knocked it doesn't chip - it peels. Very annoying. I tried it on oil based gloss woodwork (skirting and doors) with the Leyland undercoat and also without it. If you're painting over yellowing paint then undercoat is a must, without it coverage is streaky. It has only a slight smell and it does seem to be a wipeable bright white but I'm not sure it will ever win me over oil based gloss mainly because of the brush streaks it leaves. Coverage is excellent if used with undercoat. If you've never this used this product it before I recommend practicing on area first.